Now he is accused of theft and who knows what else – legal problems which are all the more problematic with the media attention to this secretive, small town. I like the subtlety of this world that is slowly growing as more and more members of this small town are shown to be supernaturally different in some ways. After the last book with a lot of subtle hints, this book doubles up on the hints but is also being less coy with some being more overtly labelled. I like how this is paced and working – there’s still a lot of mystery there but it’s natural mystery. There’s no attempt to drag it out, there’s no attempt to pretend we don’t know things when clearly we do and no attempt to hint around things we already know or should already know. This aspect of the world building really works and creates this wonderful little town full of secrets and it’s really balanced thematically. We get this really strong sense of community, everyone knows everyone else, everyone looks out for each other, everyone cares for each other they often eat together and are very neighbourly. But at the same time, everyone also respects each other’s privacy; yes everyone knows they have secrets and everyone is equally determined not to pry into anyone else’s business. This manages to make the town both very close community and also more than a little creepy. The underlying secrecy and the things they’re not talking about underpins the whole book. 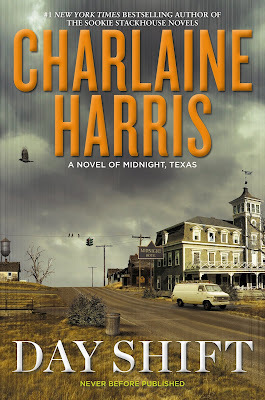 What I don’t like about this book is Charlaine Harris is using this series to declare all of her series appear in the same world. Aside from the distinct horror that in this reality poor Mannfred could technically be trapped in a room with both Aurora Teagarden and Sookie Stackhouse (ye gods that’s a fate worse than death right there), I just don’t think this works. I don’t think the worldsettings of all of these series (and Charlaine Harris has written several now) are really compatible, especially the very overt supernatural presence in the Sookie Stackhouse world which just seems really weird in the much more low key and Masquerade world of Midnight. The creatures themselves – angels, shapeshifters, vampires, all seem very different as well. It feels forced and it destroys all that creepy unknown – because we apparently have entire series of world building to puncture that mystery. It also allows for guest appearances – in this book we have two, both Barry the telepathic bellboy and Quinn the weretiger, both from the Sookie Stackhouse series. Honestly, it feels contrived. Even if we accept this whole shared universe ideal, the idea that several characters from different series (Mannfred himself is an import from the Harper Connelly Mysteries and Bobo is, I think, from the Lilly Bard series) all appear in this tiny hamlet in the middle of nowhere, Texas seems ridiculous – and more than a little desperate. I kind of want to gently tell the author that the Sookie Series is over and she needs to let it go. This series still works as a stand alone without having read the other books – but without having read the other series you will miss the whole wink-wink-nudge-nudge element of “do you know who this is? !” which is kind of the whole reason Quinn and Barry are there at all. As for the plot… I kind of give it a moderate meh. I think the residents of this town got themselves rather worked up over relatively little. I think once the media moved on from the town (and, really, I’m not sure the media would have been as focused as they like to present) there was no reason to keep panicking, especially since the only reason Mannfred had any legal trouble was because a highly unpleasant, paranoid man kept accusing him of theft – and no-one believed him (with an added level of ableism because it’s implied this man, Lewis, is mentally unstable and therefore everyone should/is dismissing him). It kind of feels like everyone got themselves really worked up for little reason. If anything I would have been more suspicious, as law enforcement, about how much people seemed to be over-reacting. In fact their actions brought lawyers and police to the town during dangerously sensitive periods. What I found frustrating is that everyone was running around worrying about Mannfred’s overblown legal problems and that meant we didn’t expand on the far more fascinating plot lines of Olivia’s family (and her profession) and whatever sneaky shenanigans were going on at the hotel. I presume both will be addressed in a later book. The characters and the world building keep me invested in this series and, yes, I do have to say I’m pleasantly surprised and appreciative of the diversity. But the plot didn’t really engage me, I found the focus a bit too scattered and the blatant inserts from other series to be both out of place and not particularly useful.